Patric Sandri has a dynamic academic background; he studied applied sciences and arts at Lucerne University and received his masters from the Royal College of Arts in London in 2012. The Zurich-based painter (b.1979) is one of the most thought-provoking emerging artists. He explores colour, light and shadows in his works and brings out a delicate sense of questioning about the role of the picture. Characterized by the qualities of texture and colour, rather than the distinctive figurative painting lines, Sandri has a painterly eye that demonstrates an intelligent interpretation of what a painting could be. In other words, as an emerging artist, he is able to render an alternative approach about how a contemporary painting can be. 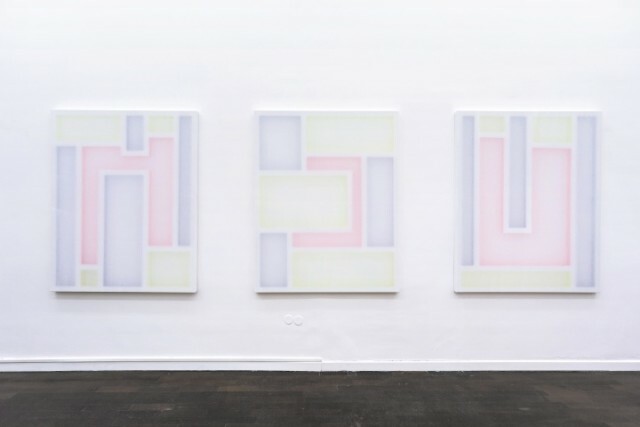 An architectural approach is also present in Sandri’s work in which the meaning of the space is portrayed on his canvas via geometrical compositions and shapes. He seems to be very interested in architecture and how his work acts in a real gallery space. He plays with the various interspaces depicted on his canvas by showcasing a space within another space. 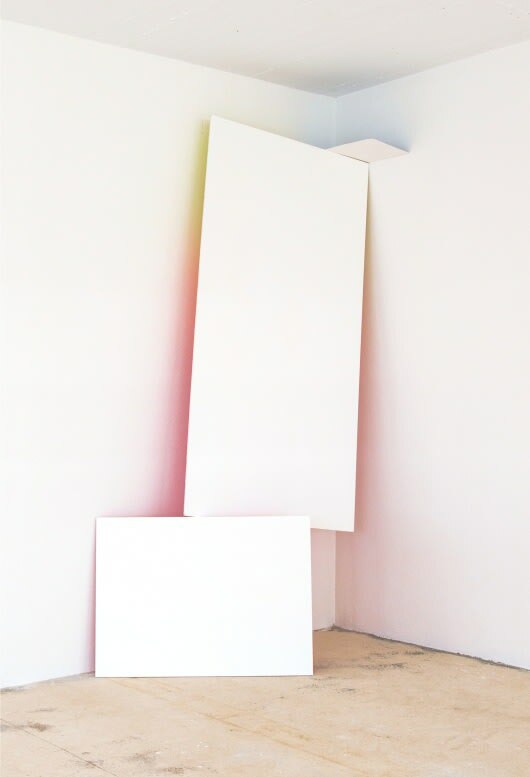 The spatial interpretation in his works is a key element that contributes to the artist’s concern about how his abstract painting may be perceived. Most of the times, the artistic outcome of his painting process consists of a colourful fusion generated by the way he painted the stretches behind the transparent fabrics and how these colours finally reflect on the wall and through these tsansparent fabrics. 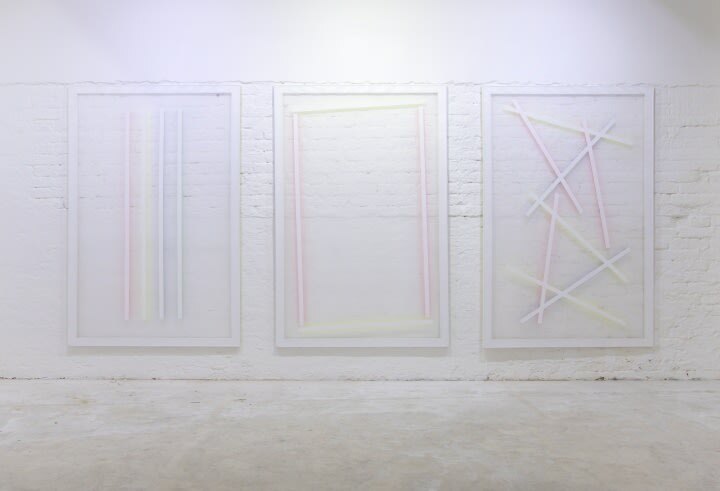 In this respect, Sandri both echoes and encourages deeper engagement with his work, inviting the viewer to participate in order to question the forms of the picture. 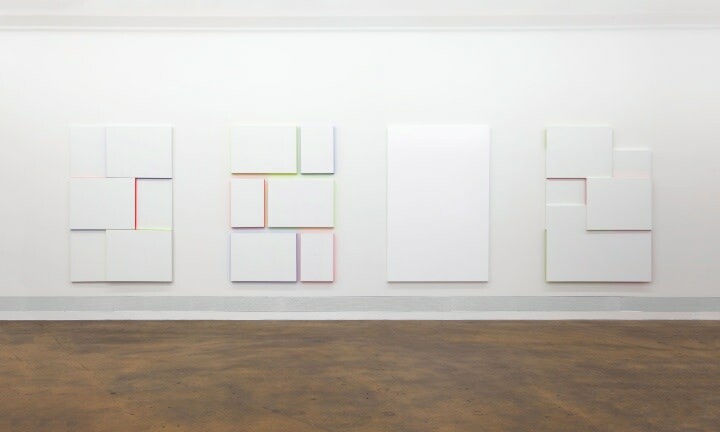 From large monochromatic paintings, with transparent details that create illusions in the eye, to white canvases with colourfully painted margins or other bright colour compositions with various geometrical shapes, Sandri remarkably probes the functions of the visual perception in a broader context. 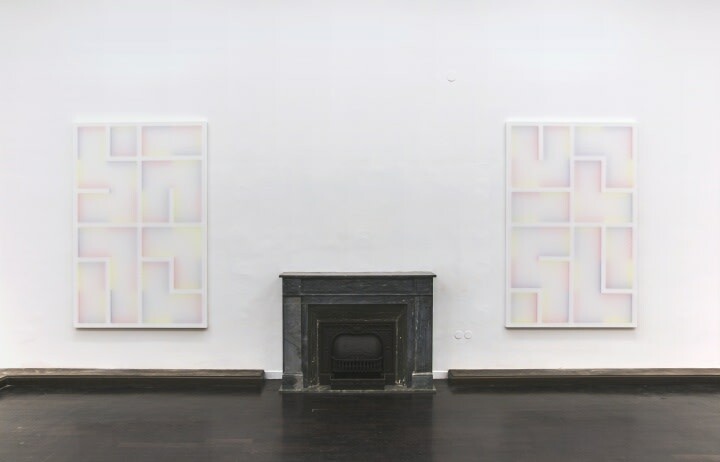 In his most recent exhibitions, such as Between Numbers and Poems (2016) in Naples or Softening the Margin (2016) and Eight Canvas- One Painting (2016) in Zurich, the artist transfers these artistic elements in front of the viewers’ eyes. Here, in his interview with Art Verge, Sandri elaborates on his artistic process which “switches from painting to sculpture back and forth” and answers some personal questions that offer another perspective on his charismatic personality. My works are based on ideas. In painting I am interested in the canvas on the stretcher frame, the object itself. Or the canvas as an architectural element. When I start making a work, the first step is the analysis of this object, which has a sculptural character, displays various norms or qualities, depths and interfaces. Hence, I give these often neglected components of painting a meaning. I am trying to find corresponding personal systems and visualisations. All the works and ideas will be developed as sketches on paper or in sketchbooks and I try to distil these until I think the idea is creating a dialogue with the surroundings, the space. So I try to work more or less site-specific and like to create a series of works for each exhibition. I would also say in terms of process that one painting leads to the next one. It is more a thoughtful process than a process with coincidence. The work is finished when it is stretched and installed on the wall. Then I see if it is good or not. All the works need the wall because of the reflection of the colours. My work switches from painting to sculpture back and forth. The focus is on the awareness of the ‘gaze’ and the aspect of looking, whether it is by the artist, or the viewer. This extends into how light and material can interfere and interrupt the gaze and result in a phenomenological response, such as perception, affect and illusion. What seems painted is a visual irritation or what we observe as an illusion. So the light completes the paintings and is also thematized by these image back sides, the sides of the canvas and the stretcher bars which are painted. 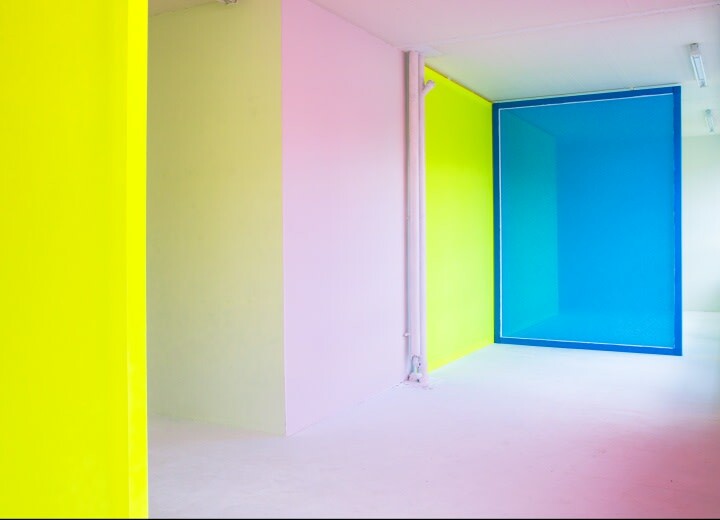 The colours reflect and radiate on the background which is dipped in colored light. When or what is that moment you realise that an artwork is finished and ready to present it? Everything concerning my work has to be planned. So the first thing I do is the concept or the idea. When the works are stretched and hang on the wall i am able to say if these are good or not. Then they have ‚to persevere’. I can highly recommend the book: ‚Seeing Is Forgetting the Name of the Thing One Sees‘. Over thirty years of conversations with Robert Irwin. The essay ‚Ways of Seeing‘ from John Berger who died 2 January is a must too. What things does your mum think about your art? She is fascinated by the works. Both of my parents try to come to as much exhibition as they can. I don’t know what she exactly thinks about the works. Christian Herdeg – Lyrical Minimalism at Haus Konstruktiv in Zurich. A coffee before I came to the studio. It really depends. Sometimes it even swaps over and on the other hand, it can also be completely empty. I try to get up every morning at 9. Until midday I usually do admin work, writing emails, research, reading the newspaper, etc. I prefer the afternoon and evening to have work done. It also depends on my workflow. I live in Zurich, Switzerland. If it would be warmer during the whole year, if there would be more sunshine, an ocean, more fruits and cheaper to live, it would the perfect place. I like to travel and discover the world and I think there are a lot of nice ‚spots‘ on this earth. At the moment I enjoy spending a lot time in my studio to explore new ideas. There are already some exhibitions planned in 2017. I am looking very much forward to these and I hope that 2017 will be as good as 2016.